Inflamex is a potent and effective supplement designed to nourish and encourage joint movement. Boasting complete side-effect free administration, Inflamex is suitable for sustained use and comes highly recommended., a natural and powerful ingredient known for its potent, natural properties. Xanthan Gum - E415 - 32,800mg/kg. 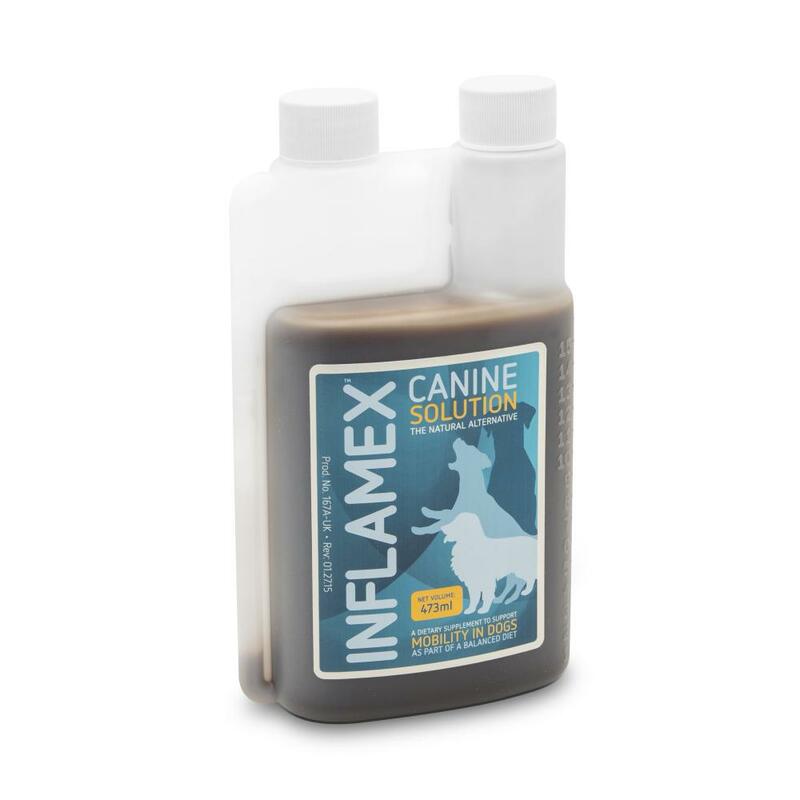 Below are some recent questions we've received regarding Inflamex Joint Supplement Liquid for Dogs, including answers from our team. I would suggest a joint supplement such as Yumove if he isn't on one already. Although this isn't an anti-inflammatory in itself it could increase joint mobility and suppleness and reduce the dosage of pain relief required. Unfortunately Metacam is usually the kindest of the prescription medications. There are other NSAIDs such as Rimadyl but if Metacam did not agree with him this may not either- though you can discuss trying other options with your vet. Inflamex may be a good alternative option to try. It will never be as effective as a prescription medication but may offer some pain relief and is unlikely to cause any problems. Can it be used with Yumove Dog? My collie is on Yumove Dog, which has improved his stiff shoulder, but he still limps by end of walk. Would this be a good addition, or should it be alternative? It should be safe to add this product as well. The degree of benefit you will notice is difficult to predict and sometimes a problem is bad enough that no treatment will make it completely better. However if things are not too serious, then some further help should be possible. Keeping exercise regular but gentle and not prolonged can help, as can some weight loss if your dog is at all heavier than ideal (which means less food usually). This product might well help but it often takes a few weeks. However it would be much better to take your dog to a vet to get a proper diagnosis. There could be lots of different reasons why your dog is struggling a bit, but most likely the problem would respond much better to prescription anti-inflammatory medication. I am sure if your dog could ask you, he/she would request something effective for the pain and your vet is better able to provide that initially than us. Once your vet has started things off, we might well be able to help maintain treatment as economically as possible. This product is less than 1% fat so it should be perfectly OK for your dog. I would also suggest you look at Cosequin sprinkle capsules. You can open the capsule and mix the powder inside with some tasty food. The ingredients of Cosequin are very different from Inflamex and they can both work together to help for this type of problem. I bought this product 18 months ago, I still have some left over but the container doesn't have a use by date, I was wondering how long can I use it for after opened. As soon as a container like this has been opened, some contamination and deterioration of the contents will begin. This is usually a very slow process, but it varies in every case. Ordinarily it is better to use the contents within a couple of months and then one can be fairly certain it will be safe and effective. After 18 months the product might have changed quite a lot, even if it looks the same. It is unlikely to be unsafe to give to your dog but you cannot be sure and it might well not be much use in any case now. We would have to suggest that it is discarded after this length of time.